10,393 others viewed this post. Fresh off the sensor, here is tonights 58% moon with full colour and earthshine as imaged from Byron Bay Observatory. When the moon gets this bright and high in the sky she is hard to ignore, and it’s almost impossible to image anything else except the larger planets. So I’ve tried here to photograph her as best as I can with everything I’ve learned. The 50+ exposures took about 15 minutes but the processing took me a over an hour. The colour is natural and real, the moon has hues that relate to its geology – blue for titanium oxide and green for lithium. The blue on the dark side however is coloured by the earths reflection, and being mostly water on the surface, we are a blue planet and our blue light is reflected back to the moon. The clear conditions and Byron Bay’s proximity to the equator and low light pollution mean we get some of the best views of the moon in the world. For the technically inclined.. These RAW Canon DSLR images are too big for Autostakkert so I used Nebulosity for stacking, aligning on points of light near the terminator, and then PixInsight for deconvolution and colour saturation. 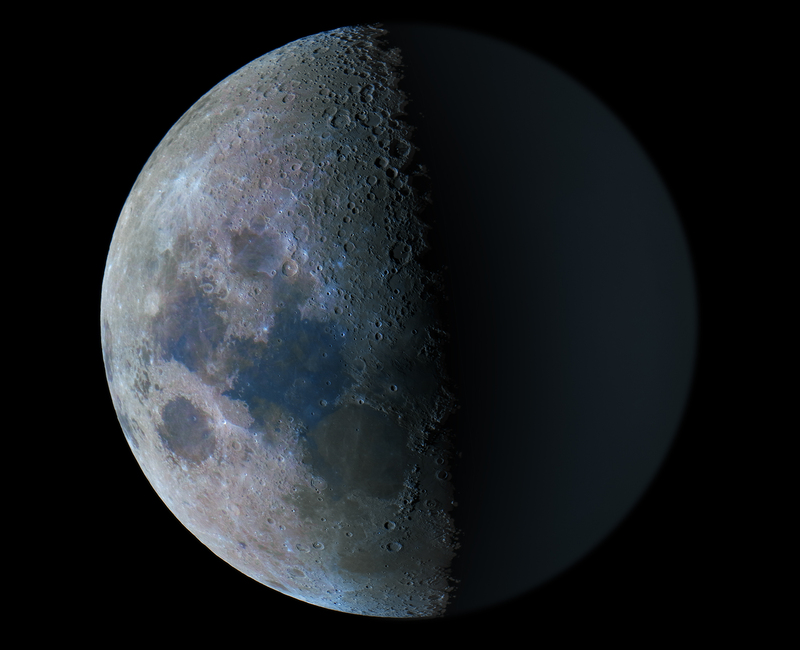 I exposed the bright and the dark side of the moon separately then layered them in Photoshop with a warped layer mask gradient to preserve the curvature between them. UPDATE : This photo was selected from hundreds as a finalist for exhibition at the LA Moonwalk event, 2016 hosted by Bill Nye! It will be printed up big and sold (hopefully) with all proceeds going to the Planetary Society and FreeArts.org !